Togo’s military has a poor record in terms of interference in politics, with coups and assassinations, and a massive military crackdown in 2005 that killed hundreds during a flawed presidential election cemented the army’s reputation or brutality and human rights abuses. However, Togo has over the past decade made strides in improving its democratic process, and has continued to deploy peacekeeping troops to countries like Mali. Piracy is a growing concern for Togo, which has responded to numerous attacks against ships in the Gulf of Guinea over the last several years and detained suspected pirates. Apart from piracy, smuggling is a large problem in the region. The country’s small navy has only a couple of medium vessels and a few RHIBs with which to patrol its 56 km coastline. Although it has a very small air force, the Togolese air arm does possess combat-capable aircraft which comprise a regionally significant attack element equal to anything west of Nigeria. External	 •	Togo is facing no external military threat currently. •	Maritime piracy has become an increasing concern in recent years. 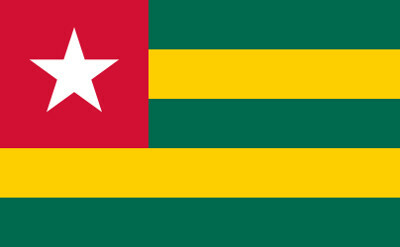 Internal	 •	Togo is currently facing no internal security threat. Regional	 •	Togo’s neighbors are currently considered to be politically and militarily stable.